The pieces I’m holding in the photo above, I found in a used bookstore! Well, I didn’t “find” them, because that’s gross. But they were selling them. Oh how life has changed. We use telephones to keep from talking to people, and bookstores to buy good candy. Which brings me to another question. Do library cards still exist? I’ll talk about that tomorrow, maybe. During the hurricane sleep over, I downed 8 boxes of boston baked beans from the bodega in the neighborhood. I want some more now. Library cards do indeed still exist. I just used mine on Tuesday :-D. I prefer going to the library and checking out books. 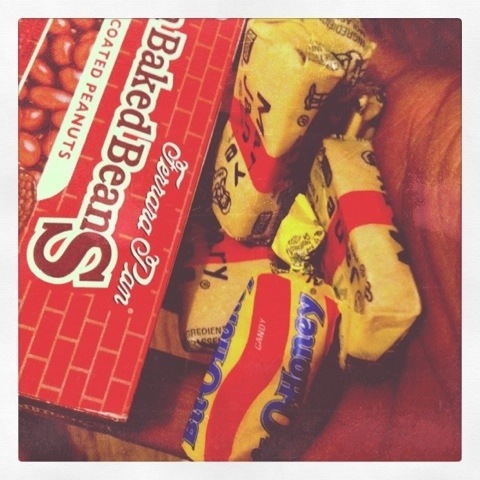 Oh, and Boston Baked Beans and Mary Janes are my ish! I still snack on those every once in a while. Charleston Chew. Eww is right! shout out to vintage candy. shout out to library cards. Dont be lame and read blogs on Labor Day. Seriously. Go to a cookout. A parade. Pack away your summer clothes. Something. But dont read blogs.